I was out walking my dog in a neighborhood near me. I noticed that there was a beautiful view, and I wanted to see which direction I was looking. 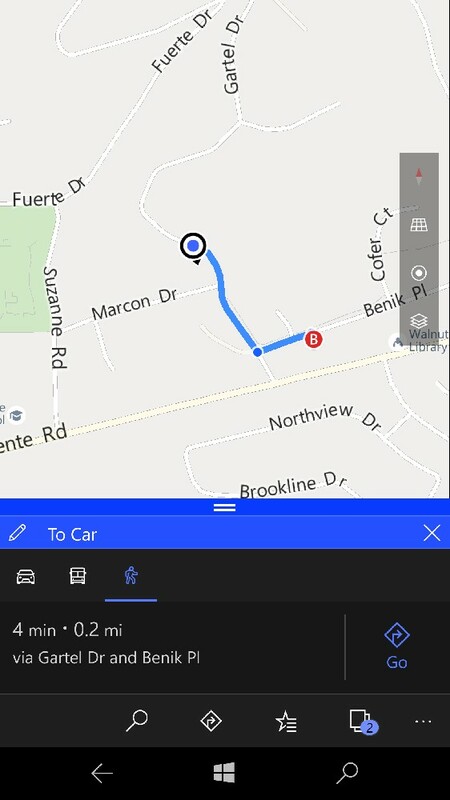 I opened up maps on my phone and then I realized that there was an item marked "car." I looked at where the car was located and, sure enough, that was where I parked. I guess maps now has automatic car location. Cool. Scienceguy Labs, Josiah23, libra89 and 1 others like this. That's pretty cool. I really wish location services would catch up to Android's capabilities. I wish Cortana would pop up every once in a while letting me know what's near me... restaurants, restaurant reviews, places to see, etc, etc. Yeah they have that now. Kinda silly since everytime I use the bus or public transit it thinks I paked my car at the stop. Why is it my lumina535 phone are not able to use my messenger ? Why my phone is asking for reset protection key?